Yes, that is my hair as of today. 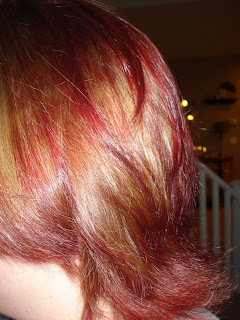 You see, I've always wanted fire-engine red hair, like Debra Messing red. I've tried countless times, and failed. I don't know why I thought today would be different. That crazy person in my head can always convince me "this time will be different." But in the end, I always have patchy red hair. My hair just won't take this color for some reason. And this time I made sure it wasn't because I missed a spot, it turned my hair a weird blonde too. So I know what I'll be doing tomorrow! Going back to Target to get a new color. Sorry, hair! Oh no! My stylist can't do it until next week! Can I wait that long? Probably not, I can't go any place someone I know would see me with this hair. The picture doesn't even come close to the shocking reality. I did the exact same thing a few weeks ago and had to get it professionally fixed... best of luck. Is that my best friend Erin? A blog yet? lol! there are definitly benefits to having a beautician for a mother! I'm so terribly afraid of having my hair go a crazy color (green is my megafear).